We have experienced faculty for IELTS LIFE SKILLS LEVEL A1 students. We provide them study material which is prepared by our experienced staff which will help students to achieve first class passing marks which is required by UKBA to log UK Settlement Visa. • We guarantee that we will make you achieve the desired Level so that you can pass the UK visa English test. So many students have passed this test through us and have secured their Visa \'s. We assure 98% success rate because of our training schedule. 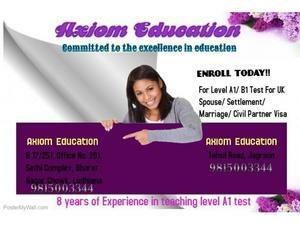 AXIOM Education deals in UK Border Agency approved English for level A1 & B1 Marriage/Spouse/Settlement visa. UKVI Approved and Authorized English Test and Training centre in Ludhiana. There are different levels of IELTS LIFE SKILLS for different purposes. Level- A1, B1. Level A1/A2-UK Spouse/Marriage/Settlement Visa English Test (Only Speaking and Listening).We have 100% success rate so far. We deliver a world class tailor made coaching suited to all students on basis of their requirements and previous qualifications. The A1, B1 test consists of only two modules LISTENING and SPEAKING. The student who is 5th class or lower can pass this exam very easily. We are specialized in this test so we have a special format to teach this level of students; in short we can assure you 100% positive result.